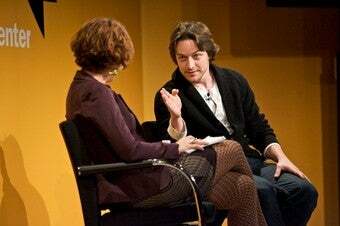 James McAvoy, we're happy to report, is just as charming as you'd hope — yesterday Times Carpetbagger Melena Ryzik talked to him about his acting career, "the destructive force that is the backpacker," and the politics of silly accents. The TimesTalk was part of the New York Times Arts and Leisure Weekend, which also featured interviews with Carrie Fisher, Gabourey Sidibe, and others. McAvoy and Ryzik weren't the most natural fit, and their talk got off to an awkward start. Ryzik had some clunky questions, like whether McAvoy thinks about a specific person when he's doing a love scene, but McAvoy mostly handled them deftly — in romantic situations, he said, "the other person in the scene is my muse." He was appealingly self-effacing about his career, saying that if he hadn't gotten into drama school he'd be "doing something else," and that he was chosen for the part of Nicholas Garrigan in The Last King of Scotland because "there were very few young Scottish actors who were the right age and quite experienced and were still cheap." His acknowledgment of the serendipitous nature of his early working life wasn't just false modesty — it was also a good reminder that much success, especially in creative fields, involves a certain amount of luck. "If... All You See Is Someone Who Is Overweight And Dark-Skinned, You&apos;ve Missed The Point." Ryzik and McAvoy also discussed his acting process and which movies he was best known for, but the interview was most interesting when it touched on politics. McAvoy described The Last King of Scotland, about a young doctor who travels to Uganda and becomes close to dictator Idi Amin, as being in part about "the destructive force that is the backpacker." He opined that while he enjoyed being a tourist, he didn't "know how healthy we are for other countries" — and while the talk didn't delve deeply into the thoughtless imperialism of the traveling westerner, it was good to be reminded that The Last King of Scotland was as much about the sins of a young Scotsman as it was about the excesses of a totalitarian leader. Speaking of Scotland: it's a cliche that American women swoon over Scottish accents, but I do have to say that I would have sat through the entire interview just to hear McAvoy say "worldwide." McAvoy's accent has apparently served him well — he pointed out that the Scottish brogue is actually quite difficult to imitate, and his homegrown one was instrumental in getting him the part in The Last King. Ryzik also asked why the actors in McAvoy's new film The Last Station — about the life of Tolstoy — didn't speak in Russian accents, explaining that it's a "moviemaking convention" to adopt foreign accents to play non-English-speaking characters. McAvoy didn't hold back: he said that convention was "just so rubbish," and that "what should be said is why aren't we speaking Russian." He also answered his own question — American audiences wouldn't see the movie — but it was refreshing to see an actor address one of the dumbest and most egocentric concepts in American film. The idea that people from other countries talk funny even when speaking their native language, and that we should mark them as foreign by artificially skewing their speech but not by allowing them to use their actual languages, has made for a lot of crappy movies (cf. The Reader). I would've liked to hear McAvoy talk more about issues like this, and less about who he's imagining when he's kissing Keira Knightley, but as it was, he acquitted himself well even in a less-than-satisfying interview — an actor rising above his material.